Your rifle’s accuracy is only as good as the scope that you use. That’s why it’s so important to invest the time and energy necessary to find a solid scope that works well for your intended purpose. The Vortex Diamondback 4-12x40mm Riflescope offers exceptional durability, gives a clear view of the target and works over a long distance. The Vortex Diamondback riflescope offers several features that are designed to make your next excursion more enjoyable. It’s solidly built, and it uses a solid, one-piece aircraft grade aluminum allow construction for ultimate durability. This material also makes it extremely resistant to heavy recoils. The scope is also able to eliminate internal fogging by using Argon gas while also serving to provide protective properties over an extreme range of temperatures. When it comes to clarity, this scope offers crystal-clear vision and you’ll enjoy fully multi-coated optics that are capable of transmitting 91 percent of the available light. The scope comes with a protective lens, and it features fast and easy to use windage and elevation pop-up dials. This scope will work with a variety of rifles, and it’s exceptionally well-suited for rifles that are designed for hunting. It has good long range capabilities, and it is also an exceptional option for target practice. The dead hold reticle uses a modified design that gives it a unique method of operation. The result is that you’ll be able to eliminate much of the guesswork that is associated with windage and hold-over corrections. Use this scope for shooting at multiple ranges where the issue of hold-over could present an issue. The Argon gas that is used in the scope also has the advantage of not reacting negatively to water or absorb it. This makes it an ideal scope for a wide range of applications, terrain and weather conditions. It’s designed to make it easy and fast to make quick windage and elevation adjustments, and it’s based on the zero reset accuracy system. In practical use, the glass on the scope is extremely vivid and bright, and you’ll be able to get a clear view even at the edges of the scope. Focus adjustments are extremely accurate and won’t obscure your shot, and you can make adjustments quickly. Overall, it’s a good all-around scope for general purpose hunting use. Experienced hunters know that simple is often the best option when it comes to reliability and performance. 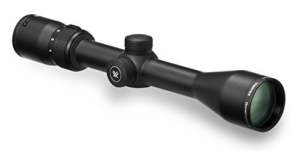 The Vortex Diamondback is a reliable scope that uses a simple design. It’s not meant to do everything, but it excels at what it is designed to do. The design makes it rugged, long-lasting and you won’t have to worry about damaging this scope on more intense hunting adventures. It’s a single-objective scope that is designed to help you hunt game from a distance with the ease and simplicity of an expert marksman. You’ll be able to render 1/4-inch MOA click alterations at a range of 100 yards, which makes it exceptionally accurate. The design is lightweight and fairly short, so it won’t be a burden to carry with you. It’s an ideal scope for general hunting at a distance, and you’ll find that it’s easy to handle and install. It’s designed to be used by a right-handed shooter, and some modifications would need to be made if you’re left-handed. The nicest feature of its design is that it works equally well with new and older guns, and you’ll be able to interchange it if you wish. This scope is a solid scope that will introduce you to shooting with a scope. It’s great for those who are on a budget, or for hunters who need a scope they can knock around a bit. It’s not a professional scope, but it’s a great option for those who hunt sporadically or consider themselves beginners. The simple design and limited options make it simple to configure and use. You’ll be able to get up and running with this scope in no time. The scope is an excellent first-time purchase for someone who is new to using a scope. It doesn’t make sense to buy an expensive scope until you know exactly what you need. By going with a high-quality, entry-level scope like the Vortex Diamondback you can gain experience and learn what features you need most in a scope. It’s important to realize what you’re buying when you get this scope. Customer reviews tend to rank this scope highly, but you should realize it’s not a professional-grade scope. No scope is perfect, and this scope does have some flaws. However, the overall value and features for the price make this scope a great deal if it fits your personal needs. For a middle of the road, general purpose rifle scope, this will satisfy the needs of most customers. That is why it is one of our highest recommended scopes, and why it also shows up on other similar lists. On the plus side, the focus range is exceptional. You’ll get extremely precise cross-hair focus, and the precision doesn’t diminish as objects gain greater distance. The scope is worth more than it’s advertised price. When it comes to features, reliability and price, this scope is in a league of its own. It’s also extremely tough, and you don’t need to worry too much about any rough handling, which is another reason it’s perfect for the beginner. The downside is that you need to be fairly accurate with the alignment or you’ll likely miss your target. You’ll need a sharp image of your intended target with zero field of view loss. Because of this, it may take some time to adjust your shot. Late afternoon shooting could be hampered somewhat by the available light, but it’s still usable in a variety of lighting conditions. Finally, the parallax is great at about 10 yards. Try to go above 50 yards isn’t really practical for this scope.